the Ministry of Natural Resources (MNR) that the cancellation of the spring bear hunt and its replacement with the provincial Bear Wise Program would negatively impact public safety. Instead of managing Ontario’s bears for optimal sustainable populations as it is mandated to do the province has instead opted to try to manage people, with dismal, and sometimes near fatal results. 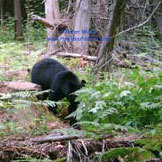 the Ontario government needs to reinstate the spring bear hunt,” said Terry Quinney, O.F.A.H. Provincial Manager of Fish and Wildlife Services. Already this season, police have killed bears in London and Peterborough that presented a threat to people. In Severn Township, the search continues for the bear that inflicted extensive wounds on a Waubaushene man last week in an apparently unprovoked attack. In 1999, the province promptly and without scientific reason, cancelled the spring bear hunt, resulting in a ten-fold increase in occurrences of human-bear conflict. resulting in more sows and cubs shot and wasted in the protection of property. MNR statistics reveal that human bear occurrences rose to 12,645 in 2007/2008, up from an average of 1,000 prior to 1999. “We are convinced that human-bear conflicts can be minimized, by managing bear populations using a variety of tools, including area-specific quotas and an early season hunt,” added Quinney. and the voice of anglers and hunters. For more information, visit www.ofah.org.